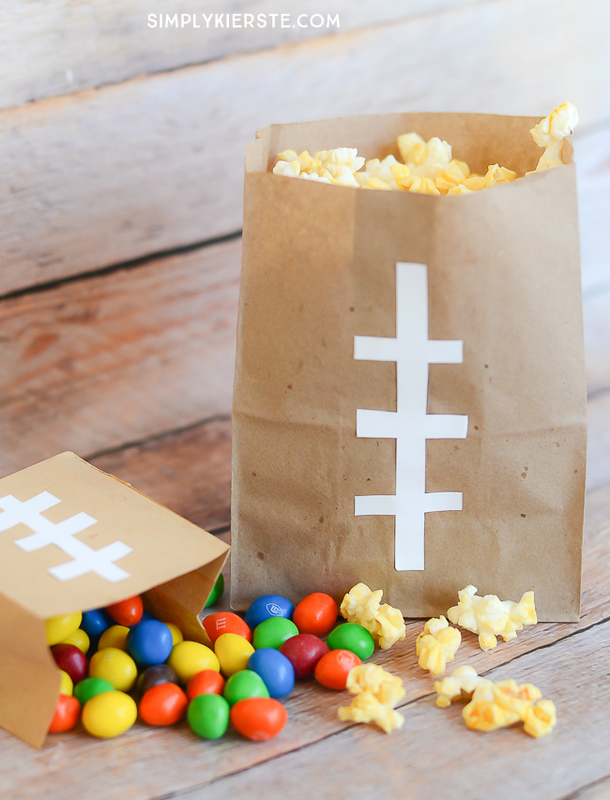 I know many of you are looking forward to this weekend’s Super Bowl, and getting together with family and friends to watch the game, eat, and hang out. However, I am looking forward to this weekend for a completely separate reason…my husband will be home from a two week international trip. I think a massage is calling my name, and probably a pedicure too. We are all so ready to have him home! That said, we are a football family, and love watching games together. Of course snacks and food are involved, and I’m all about simple . 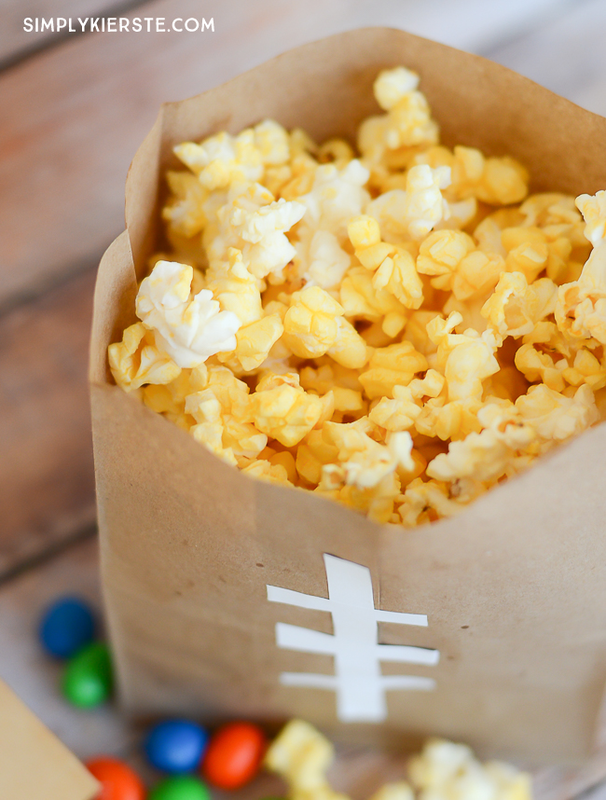 One of my kids’ favorite snacks is popcorn, and it’s a popular and fun thing to munch on during a game. 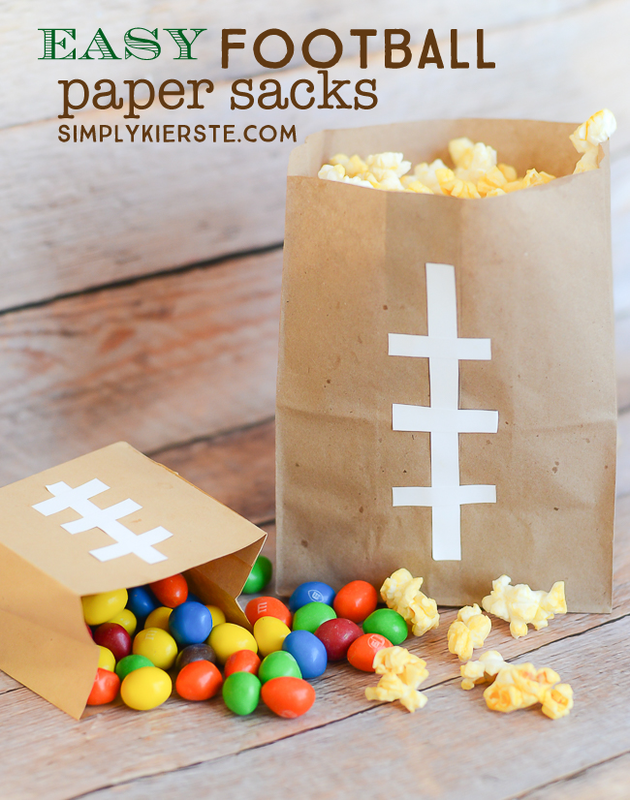 In my quest to come up with something cute for the popcorn to go in, I made (seriously) the easiest and most adorable football paper sacks to hold popcorn and snacks. Aren’t they perfect? And pretty much the easiest thing ever. Like it will take you less than a minute for each bag, and just two items needed! These would be perfect for football birthday parties and taking to one of your kids’ games to hand out to the players. Wouldn’t you be the coolest mom ever? And it’s so fast & easy! They are also extremely cost effective–paper sacks are so inexpensive, and so is popcorn. We usually pop our own in the air popper if we’re doing bigger batches, and that’s really cheap. Microwave popcorn totally works too! * Cut strips from the full sheet white label to the size needed to fit on your sack–one longer piece, and three shorter pieces. * Remove the backing from the label and place the longer piece first, then the smaller pieces evenly across the longer piece in the opposite direction. I used a regular paper lunch sack, then also a much smaller one that I found at Hobby Lobby for the M&M’s. You can buy a pack of maybe 8 or 10 for around $3. The full sheet white labels you can find at any office supply store, or at a large retail store like Walmart or Target. If you already have white vinyl, it’s easy to use for this project! And that’s it! Totally cute. Totally easy. Super cute! You can not have M&M’s without popcorn. 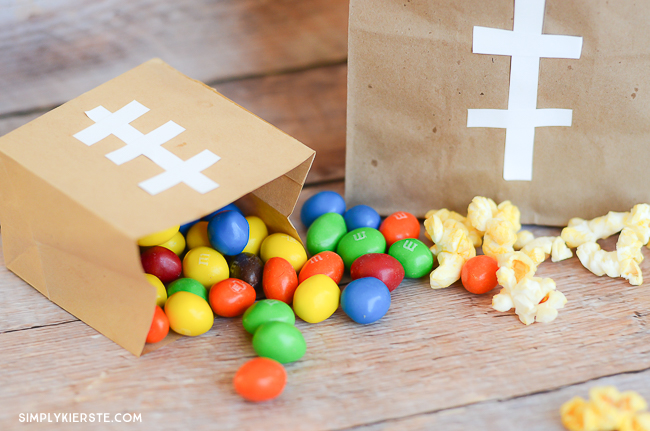 During one of pregnancies someone asked me if it was pregnancy thing…uh no M&M’s and popcorn are all the time thing at our house!